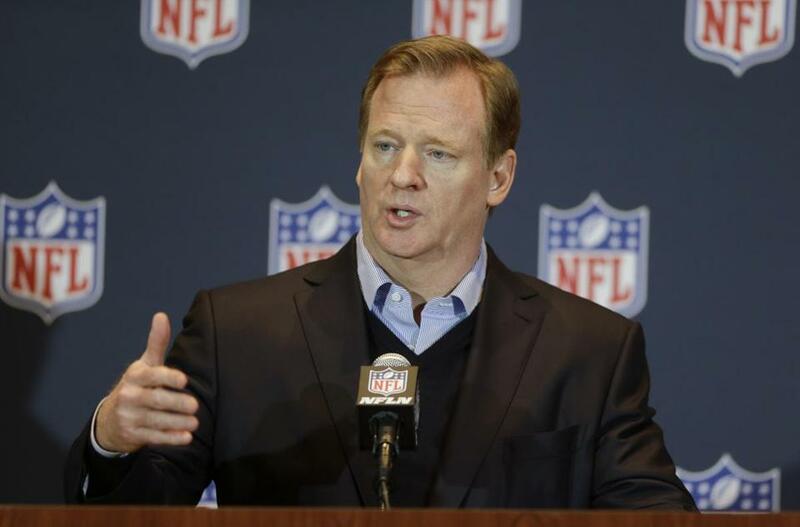 NFL Commissioner Roger Goodell spoke at a news conference during last week’s owners’ meetings. The NFL may as well book Aretha Franklin to play the concert before the opening Thursday night game in September. Because the league’s leadership has established a clear theme for the 2014 season and beyond: It’s all about R-E-S-P-E-C-T.
Two of the league’s top headlines in the past year have been as ugly as it gets: a murder arrest with Aaron Hernandez and a bullying scandal with the Miami Dolphins. Another signature moment, which wasn’t as serious as the other two but also didn’t reflect well on the league, was Richard Sherman’s trash-talking tirade aimed at Michael Crabtree moments after the NFC Championship game. Roger Goodell and the Competition Committee both made it a top priority last week at the owners meetings to stress that the league’s leadership has a responsibility to create a culture of respect both on and off the field. Graphic: How does Blake Bortles measure up? The message of respect, tolerance, and understanding was prevalent throughout the four-day event. The keynote speaker was a man named Dov Seidman, author of “How: Why HOW We Do Anything Means Everything.” His message was that NFL leadership needs to create a culture of high expectations. Players need to understand that tolerance and respect are social norms, and that using racial slurs and other hateful language is not acceptable. Another featured speaker was former NFL cornerback Wade Davis, who spoke about what it was like to be closeted and gay in the NFL and who is now executive director for the You Can Play Project, whose mission is to help eradicate homophobia in sports. And “sportsmanship” was emphasized with the Competition Committee. Don’t be surprised to see coaches take a more hands-on approach and be more visible in the locker room, a domain that many times is left to the players. Fisher, speaking on behalf of the Competition Committee, said the culture on the field needs to be cleaned up, as well. He cited a surge in the number of taunting penalties — from nine in 2012 to 34 last season — as proof that there is a lack of respect among the players. While there won’t be any new rules banning hateful language such as the N-word, the league will make unsportsmanlike conduct a point of emphasis. Even despite the increase in taunting penalties, Fisher said the officials missed several more. Fisher said that NCAA leadership has spoken with the NFL about having players set better examples with regard to sportsmanship and respect. Goodell noted that the NFL will start monitoring players’ mental health more closely and give them more resources for treatment. Our thoughts are with the loyal fans of the Buffalo Bills, who experienced a lot of sadness in the last week and now have reason to be genuinely nervous about the future of their team. Ralph Wilson, the team’s only owner since its inception in 1959 who was adamant about keeping the team in Buffalo through the city’s tough times, died at age 95 on Tuesday. And Hall of Fame quarterback Jim Kelly suffered a recurrence of his oral cancer and will now undergo intense chemotherapy and radiation treatment. Wilson, meanwhile, lived a fascinating life and was largely responsible for keeping the AFL afloat in the 1960s. He served in the Atlantic and the Pacific in the Navy during World War II, and had a front seat to history — he was one of the first responders after Pearl Harbor was attacked, at Hiroshima after the bomb was dropped, and on the USS Missouri during the Japanese surrender. Wilson initially wanted to begin an AFL team in Miami, but after that fell through he used a $25,000 investment to found the Bills before the 1960 season. He helped keep the Raiders and Patriots afloat with loans, and then initiated the talks that led to the AFL-NFL merger in 1970. While Goodell and members of the Bills organization were concerned only with the loss of their close friend on Tuesday, the reality is that Wilson’s death puts the future of the team in question. The Bills have a lease with Ralph Wilson Stadium through 2022, and a $400 million penalty for breaking the lease to move the team — except that penalty drops to a modest $28.4 million for a short window between the 2019 and 2020 seasons. So, while the Bills are likely to enter into a trust and eventually be sold to the highest bidder, and are guaranteed to stay in Buffalo through 2019, there will be strong rumors of the team leaving the city following the 2019 season. What’s it like for one of the league’s top players to go through free agency while still at the top of his game? Agent Tom Condon, appearing last week as a panelist at the Jeffrey S. Moorad Sports Law Journal symposium at Villanova, described in fascinating detail the journey his client Peyton Manning took in being cut by the Colts and signing with the Broncos last offseason. “Twelve teams were interested in his services,” Condon said. “Eleven of the 12 went to their starting quarterback and told him, ‘We’re going to at least investigate the Peyton Manning thing.’ One of the teams did not, the player found out and it ended up being quite an ordeal. The NFL announced last week the 2013 payouts for performance-based pay — $3.4 million per team to award players whose level of playing time was much higher than their salary. Not surprisingly, rookie defensive tackle Chris Jones earned the highest amount among the Patriots and 25th highest in the NFL — an extra $232,313 on top of his $405,000 salary for starting 11 games and compiling six sacks after replacing an injured Vince Wilfork. Other top earners for the Patriots included fellow rookie defensive tackle Joe Vellano ($203,479), cornerback Alfonzo Dennard ($159,404), undrafted rookie receiver Kenbrell Thompkins ($153,524), third-round cornerback Logan Ryan ($147,113), center Ryan Wendell ($135,509), and receiver Julian Edelman ($118,266). But the players won’t receive their checks for two years. As a concession for bumping up the salary cap last year, the NFL Players Association allowed owners to keep all performance-based pay until April 1, 2016 — and to keep the interest earned on the money ($108.8 million this year). First-round picks in 2011 who expect to become free agents next offseason may be sorely disappointed. While all rookies now get four-year contracts, first-round picks have an option fifth year that is team-friendly and guaranteed for injury only. The fifth-year options for 2011 players must be exercised this year by May 3 — the Patriots have not made a decision on left tackle Nate Solder, according to a league source — and the salary doesn’t become fully guaranteed until the player makes the Week 1 roster out of training camp. The Panthers already have stated that they will use the fifth-year option on Cam Newton and the Bengals will use it on receiver A.J. Green. Instead of striking it rich in free agency, the players will be subject to fixed salaries — for players drafted in the top 10 picks, their salary is an average of the top 10 highest-paid players at their position. For all other first-round picks (including Solder), they receive the average salary of players 3-25 at their position. Considering teams can then use the franchise tag twice on a player, it is possible that a first-round pick can be under his team’s control and won’t hit free agency for seven seasons. On the discipline front, commissioner Roger Goodell said he won’t punish Colts owner Jim Irsay for his recent DUI arrest until charges are filed against him. But Goodell may have no choice but to discipline Irsay severely given the details of his arrest, as obtained by the Indianapolis Star — Irsay was stopped after driving 10 miles per hour and was found to be in possession of several pills of various colors plus more than $29,000 in cash in his wallet, briefcase, and bags on the floor. And Goodell said that the three main characters in the Dolphins bullying case — Richie Incognito, Mike Pouncey, and John Jerry — will have to undergo psychiatric evaluation before being allowed to play in 2014. Pouncey is the Dolphins’ starting center, Jerry signed with the Giants last week, and Incognito is still a free agent. Still unclear is which mental health professionals will evaluate the players and what the players need to show in order to be cleared to play. Goodell indicated that Jonathan Martin, who claimed he was the victim of bullying and was ultimately traded to San Francisco, will not be subject to mandatory psychiatric treatment in order to play.